As I had leftover red cabbage, this was a great use for it. 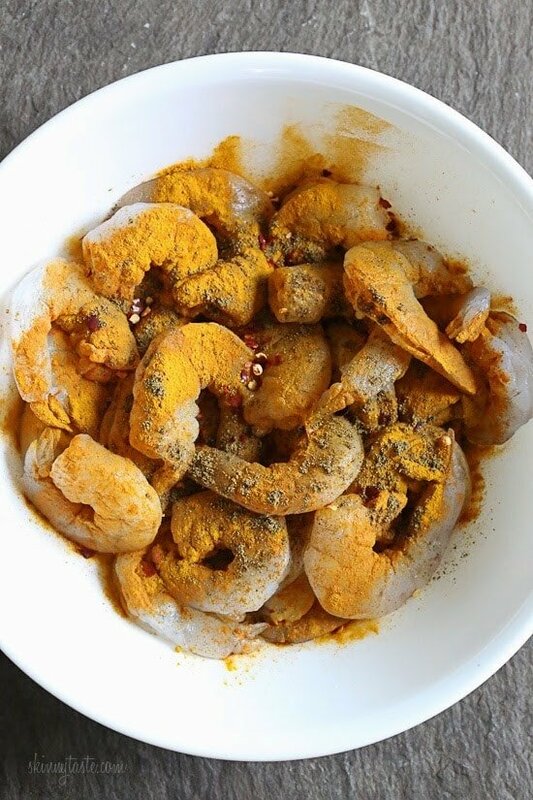 I love shrimp in most any form so that also made it a good choice. A nice light summer dinner was had with this recipe. Oooo, SO good! Hubby loves it too. This will be a go to during the hot summer months for sure! Do you think I could make this with cod fish instead of shrimp? It looks yummy, but I don’t have shrimp in the house. Thanks! I haven’t tried this but if you do, let me know how it comes out! Made this twice already and again tonight. Never change a thing but I’m serving with corn tortillas tonight so we can change it up a bit and make it tacos! Mmmm!!! This was absolutely delicious, so fresh tasting and flavorful. I would LOVE to see more variations of recipes like this. Thank you!! Make this in 10 minutes so delicious !!! Delish! The presentation was fabulous, and we particularly enjoyed the slaw. I wasn’t sure how to julienne the mango so I you tubed it. LOL I will probably make a paste from the spices next time. Just because I like to mix things up sometimes. Thanks for another winner! I only have lemon…not lime…will this dramatically change the taste? Slightly but should taste fine! do you serve this with anything else like rice? Or is it filling enough for dinner by itself? 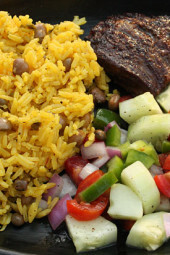 My plan was to serve it with Black rice, but I forgot that until I read your post! 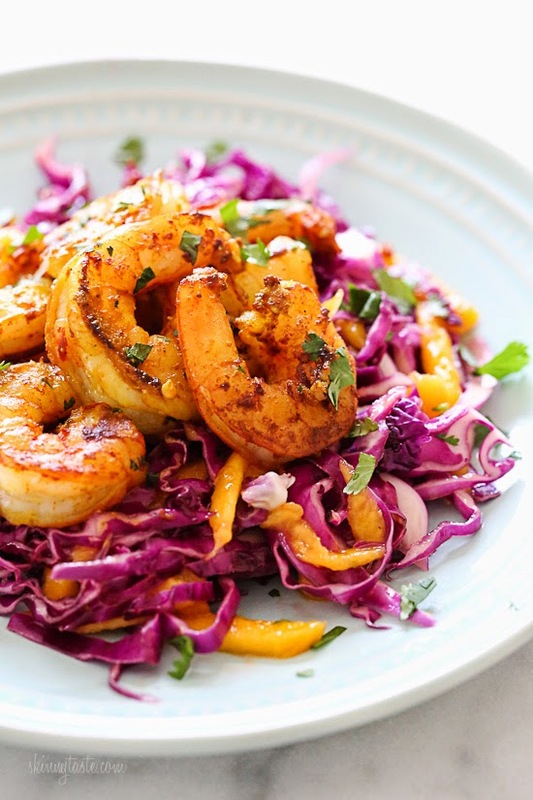 My husband is a 6’5 construction worker and he had a salad before then a double portion of the shrimp with a single portion of the cabbage and is a happy man! Could you throw it all in a tortilla for tacos? Corn or flour? 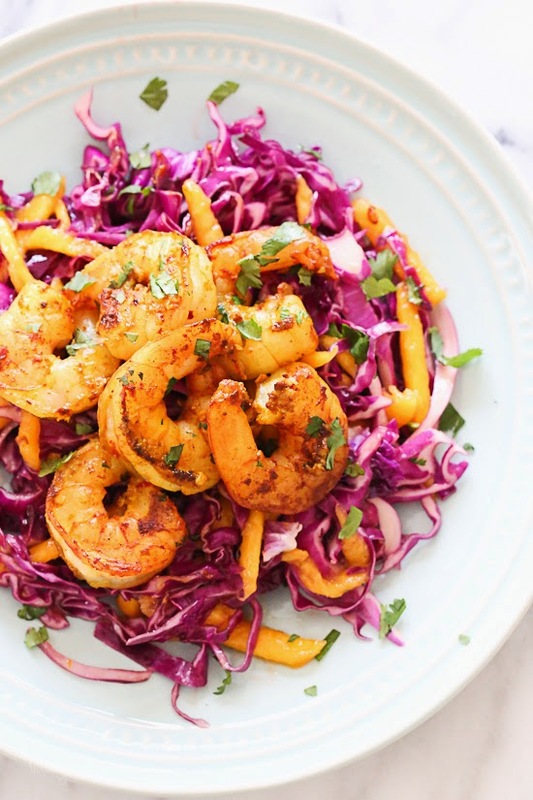 How many calories for just the shrimp without the slaw? I don’t have cabbage but I want to make the shrimp tonight. Fantastic! Used a “Power Slaw” mix for the vegetables and giant Tiger Prawns from Costco. This came together in a snap. Delicious! I cooked beans too just in case my picky son wouldn't eat it, and he loved it! Big hit. I really want to try this recipe but I really don't care for cilantro at all. 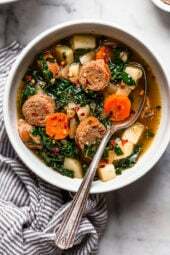 Is there a reasonable substitute for this dish? I can't wait to try this recipe! 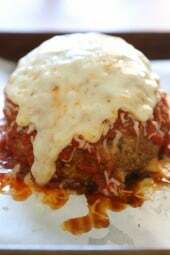 I have made so many of your recipes off your blog and cookbook and am never disappointed. My favorite so far were the chocolate stout cupcakes! I always find it difficult to work with mango, do you have any secrets for easy mango prepping or do you buy it already peeled and sliced? I do it myself, but it would be quicker to buy it already peeled. I’ve actually purchased a bag of frozen mango from the store for my smoothies n let some thaw to use for this recipe. Worked perfectly! I made this last night. It was absolutely delicious but MAN it gave me the most horrendous, uncontrollable gas!! I had to open every window in my house. I think it was the shrimp, it did not agree with me. The dish was so good it was almost worth it though. Thanks for the recipe! What else would work instead of mango? I would guess that papaya would work well. 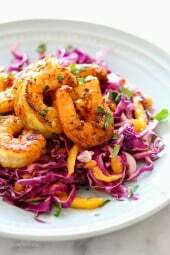 pinning it, because i WILL be having this for dinner one night next week! On the menu for this weekend! Made this dish last night and it was really yummy! I forgot to pick up a red onion so that was omitted this time. I'm sure it will be even better when I add it next time. I'm looking forward to throwing the leftovers over some fresh spinach for lunch later today. Forgot to mention that I left the cilantro at the grocery store for people who like it. We're just not fans of that stuff. 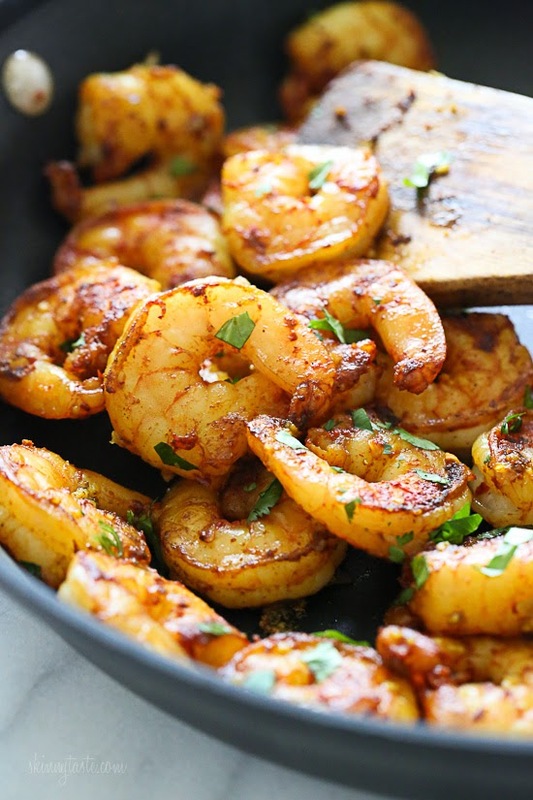 I love, love, love shrimp in any form. Now this had me salivating. 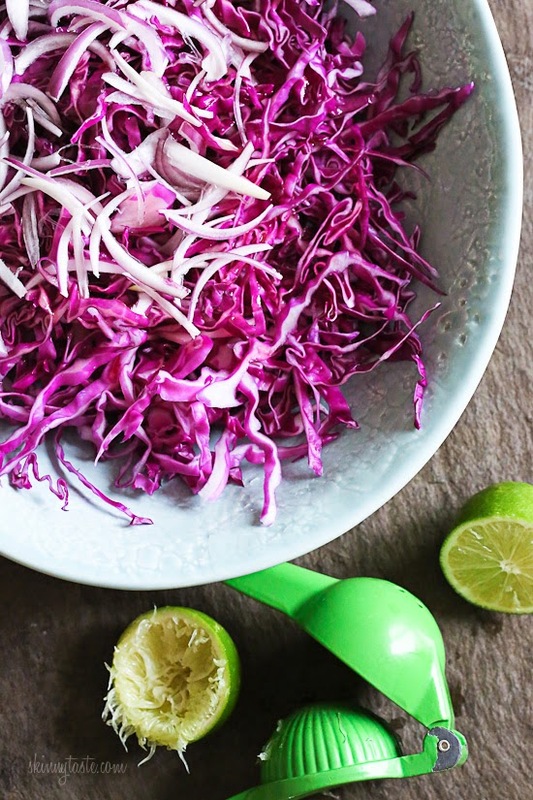 My default cabbage is the white one but this recipe makes a good case for trying out the red one. Awesome! Love this! 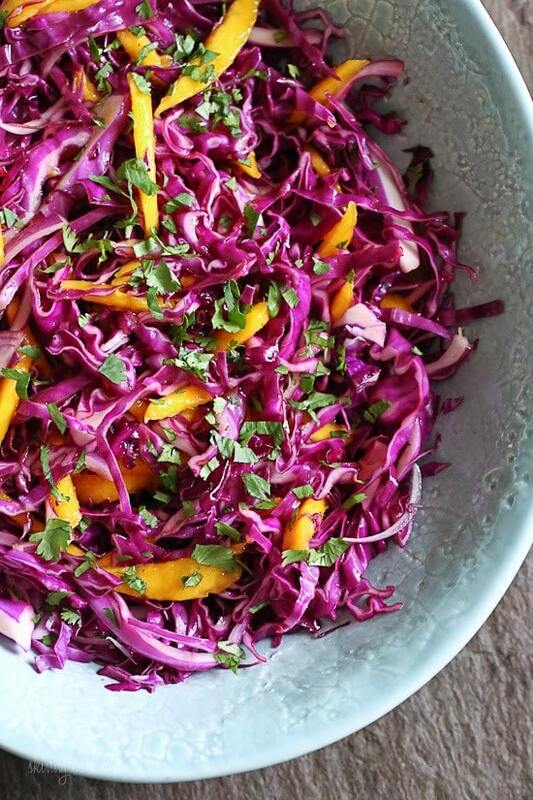 What a bright dish filled with colour!